Wednesday’s column is — why not? — a brief history of the creation of the Spider-Man character by Stan Lee and Steve Ditko, just in time for the week’s big movie. To explain the headline above, the comic in which Spider-Man first appeared was canceled after one issue. Read my column here. 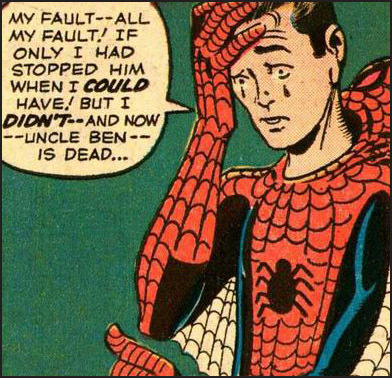 You can find all sorts of stuff online about Spider-Man, Lee and Ditko, but let me link to the Jonathan Lethem essay I quote from in the column. The art is the penultimate panel from Amazing Fantasy 15, the first appearance of Spider-Man.